Bluebirds are territorial, mostly insectivorous or omnivorous birds that are restricted to the Americas. Their preferred habitat consists of open areas with scattered trees nearby for perching and roosting; such as pastures, orchards, golf courses, parks and the edges of meadows. They may also nest outside of towns and cities. These small to medium-sized attractive birds are named after the strikingly blue, or blue and red plumage. Female birds are less brightly colored than males, although color patterns are similar. Males and females are, for the most part, similarly sized. 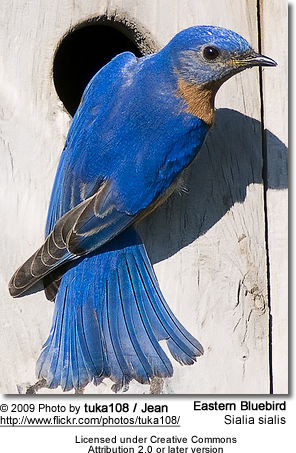 Bluebirds are cavity nesters (similar to many species of woodpecker). Once the males have identified a potential nest site, they work to attract females to those nesting sites by singing and flapping wings, and lining the nesting site, which could be a nesting box or tree cavity. Once the female accepts a male, she will then complete the nest and incubate the eggs alone. They will usually produce 2 - 4 broods during the spring and summer. During the nesting season, bluebirds are particularly territorial. The male aggressively defends the outer areas of the territory, while the female defends the immediate area of the nesting site. Bluebirds have an increased need for protein during the breeding season and at that time are particularly insectivorous, feeding mostly on ground-dwelling insects. Bluebirds are attracted to platform bird feeders. They particularly like mealworms and will also eat raisins soaked in water.